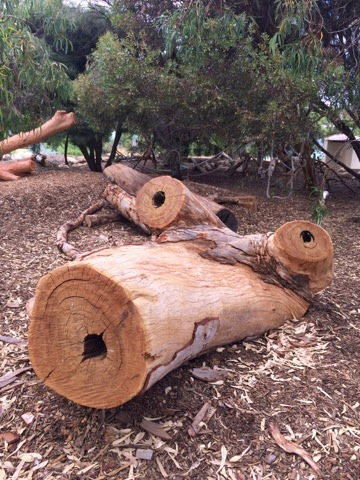 Join us on our Journey Down Under! We're an American family living in Australia, where everything seems a little bit turned-upside-down. 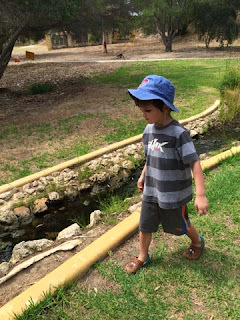 Last weekend we ventured to the Perth hills to visit Kalamunda Water Park. It's been on our summer "to do" list for the past three summers, so we decided to take advantage of the 3 day weekend and go! Upon entry, we were pleasantly surprised that it was not too crowded, even on a public holiday weekend. 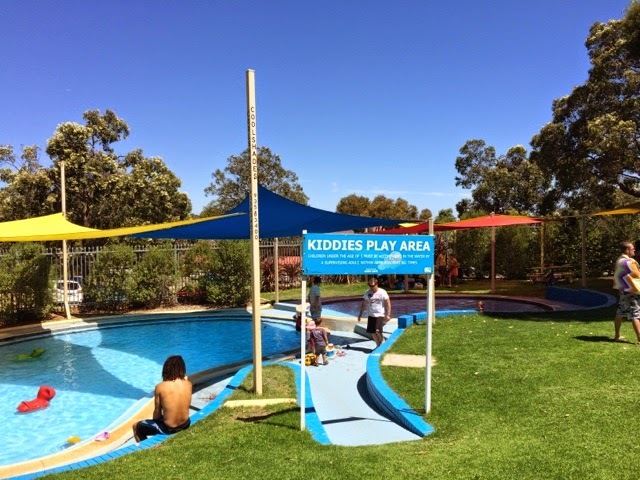 Entry fee for a family with 2 adults and 2 children was $50, and that includes swimming and slides. We had a Groupon, so our cost was less. 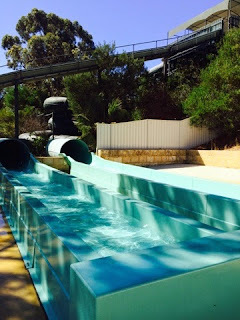 You must be 5 years old to ride the slides, so a swim only pass is available for those not sliding. The pools were crystal clear, with large beach balls and inflatable sharks to play on. There were several pools to explore including the toddler play area, the slightly deeper wading pools, the large lane swimming pool with a deep end section. The toddler area was strictly for children under 5 years old, so we didn't spend any time there, but it looked really nice. 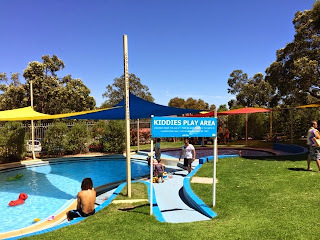 There was plenty of shade, shallow water, and loads of fun toys to play with in the kiddie pools. My kids were most excited about the big water slides, the inflatable water slide, and the inflatable obstacle course. We must have traveled down the corkscrew and zig zag slides dozens of times each. They were quite fast and had us screaming and laughing the whole way down! I was able to ride with my 5 year old the first couple of times down, but by the third time, he was on his own. 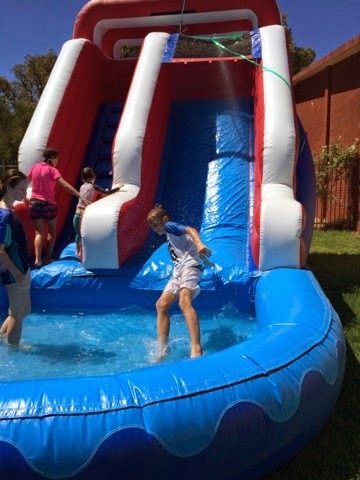 The inflatable slide was a blast too! There was a jump on the end that sent the kids flying. They loved it! 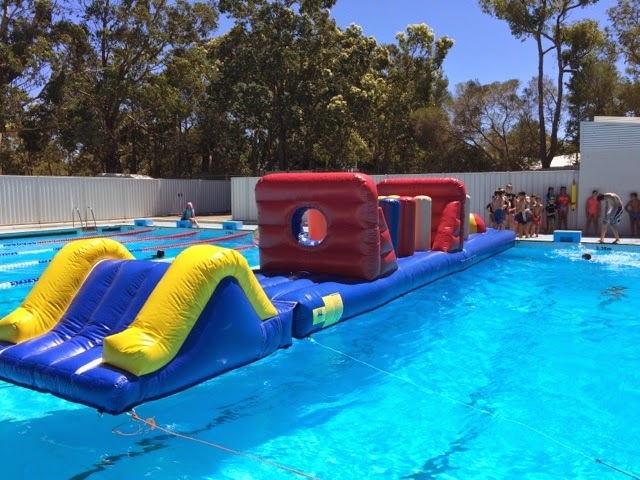 A bit later in the day, the lifeguards set up the inflatable obstacle course in the deep end of the lane pool. The kids ran through as the lifeguards squirted them with the hose and splashed them with buckets of water. 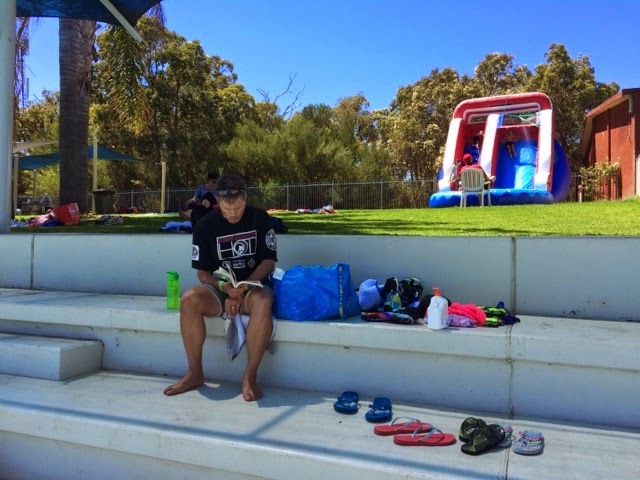 The kids were having such a blast, that my husband and I were able to switch off reading in the shade, and swimming in the deep pool by ourselves. 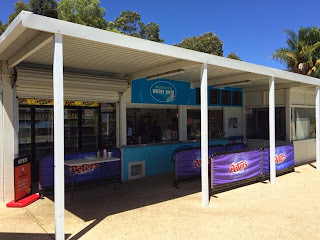 Kalamunda Water Park had a kiosk with the usual poolside menu of hot chips, ice cream, pies, cold drinks, and a selection of sandwhiches. The grounds and facilities at Kalamunda Water Park were impressive. 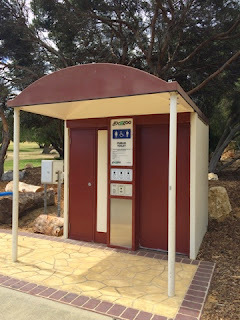 The change room and toilets were large and clean. 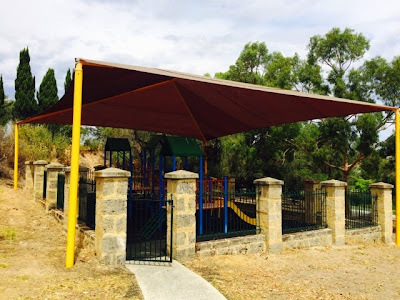 There were BBQs and plenty of shaded areas to enjoy a picnic with family and friends. 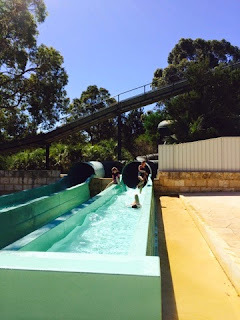 We had a fantastic day at the Kalamunda Water Park, and plan to put it on next summer's "to do" list again! If you plan to still fit it in this summer, you best hurry! The season ends 31 March. 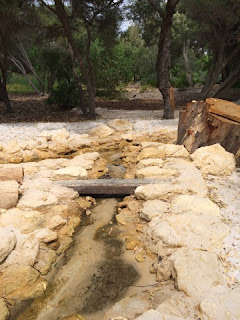 Kalamunda Water Park is located on the corner of Collins and Cannings Road, Kalamunda. Just North of the river, nestled within the shade trees, is a nature park like no other! 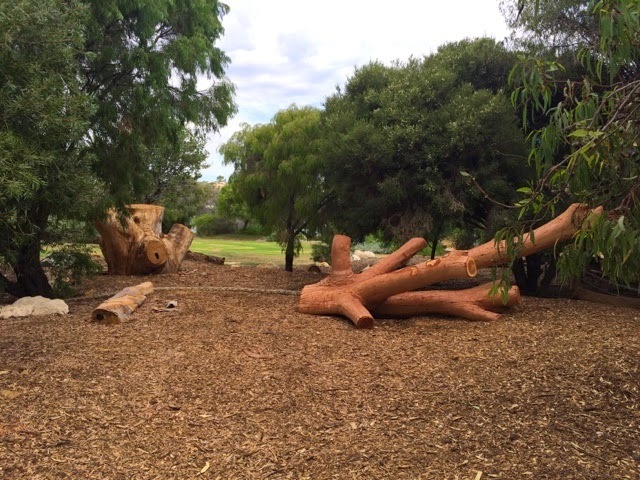 The new Russell Brown Adventure Park in Mosman Park is scheduled to have an official opening sometime in February. The park is located in Minim Cove, on the bank of the Swan River, just beyond the Mosman Park Tennis Club. 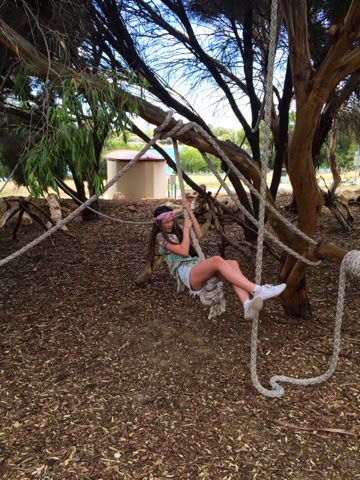 The adventure park blends in well with the bush land, and you would hardly even know it was there. It's well hidden in the bush with natural structures to climb on that are mostly made of wood, stone, and ropes. 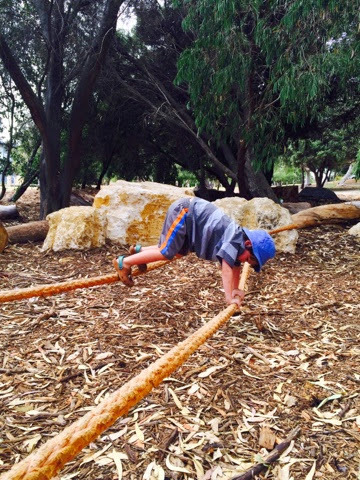 It's an amazing nature playground with which features rope and balancing areas, large fallen trees to scramble on, bush cubby houses, water play areas including a running brook. There river and a lake are nearby the adventure park, so keep a close eye on little ones. 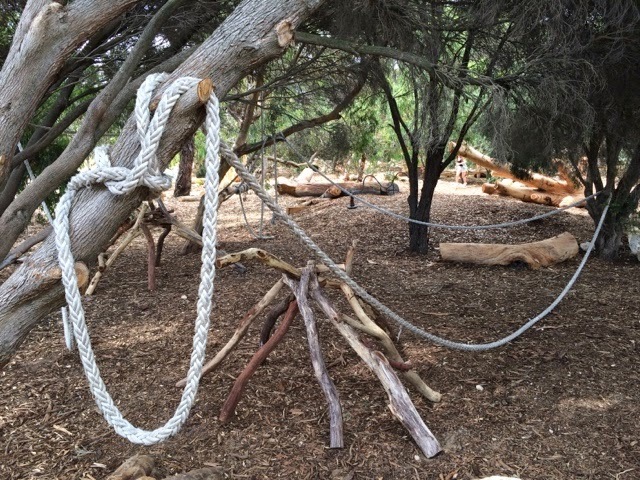 There is an enclosed area for toddlers and small children who may find the adventure park a bit challenging. Even my "tween" son and teenage daughter had fun at this park. There are toilet facilities available, as well as BBQ s and picnic tables. It seems the perfect place for a family BBQ. Our family of 5 has more Apple devices in the house than people. I'm embarrassed to say, we have more than enough iPads, iPods, and iPhones to go around. So when I came across Curbi, and saw there was a 14 day free trial, I jumped on it. Curbi is a fantastic way to "curb" your children's iPad, iPhone, and iPod use, without blocking everything out completely, and tailoring your own rules to fit the needs of each individual child in your family. After signing up, you have the opportunity to enroll the devices in your home that you would like to manage. It's easy to install the Curbi app on your own device so you can curb, block, and then watch what your kids are doing on their devices. The Curbi website has a great "how it works" tab which includes a step by step video on how to get started. There's three easy steps, and you're up and running. It's super simple! After a week of using Curbi, I received an email with a weekly usage report for our enrolled devices. 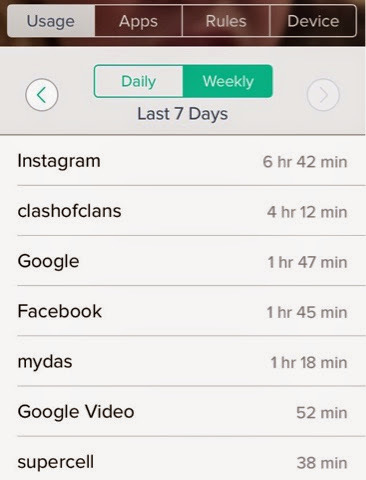 It told what apps were used, how much time each app was used, as well as recently installed apps. There were both daily and weekly reports. 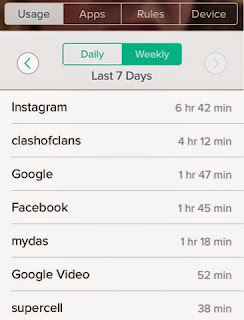 The time usage report was an eye opener for me, and I was able to use it as a tool when I talked to my children about limiting their time on the internet. I found the weekly report incredibly useful! I also received an email from Curbi reminding me to set rules for my devices. The rules allowed me to filter content or enforce time restrictions. 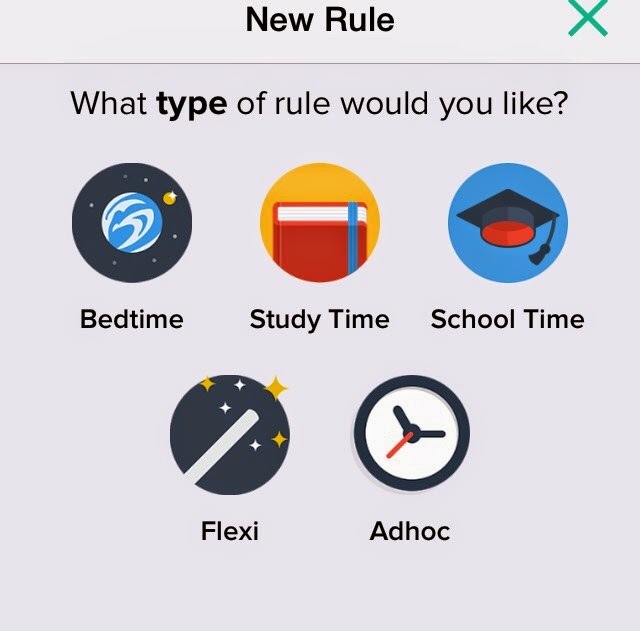 These rules are simple to set, and you can tailor them for each individual device. This feature is very important to families like mine with children ranging from 5 to 14 years old. 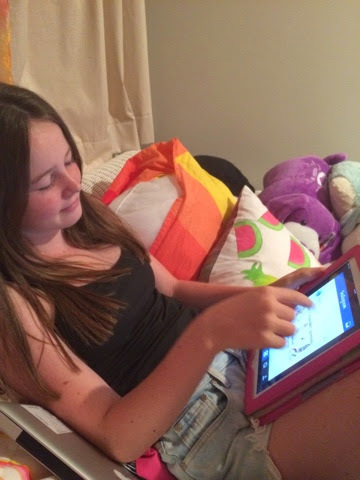 For example, some of the rules we might set for our 14 year old include: only educational sites during study time, no time wasting sites on weekdays, and no device use after 9 pm. 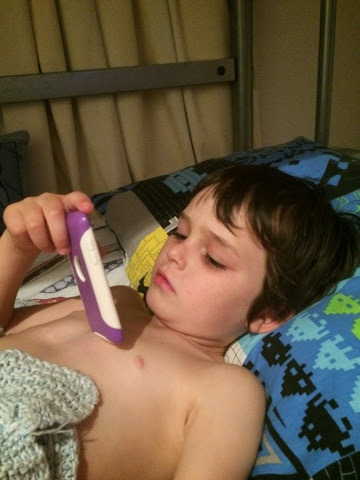 With Curbi, I have the ability to restrict use after bedtime. There's no bargaining, I just have to set a "rule". 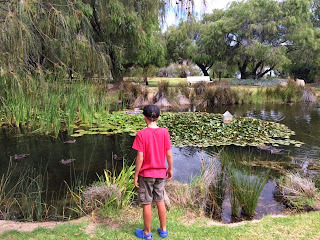 A rule we may set for our 5 year old is not allowing in-app purchases, and for my 11 year old, it's all about restricting time spent playing games. 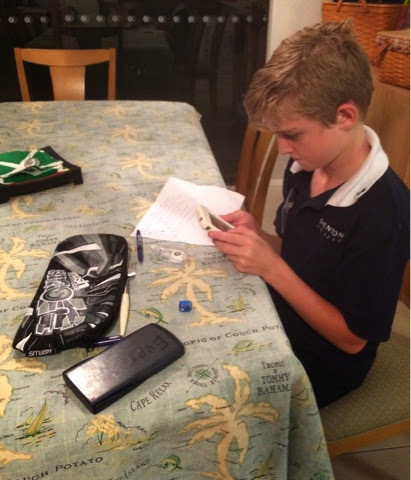 Sometimes my older kids use their Ipods for study time. With Curbi, I can set a rule to restrict what sites and apps can be used during study time. Perhaps one of the best features of Curbi is the ability to control your devices remotely. This feature is wonderful, because you don't even have to be home with your child, or even near them to do it. Simply manage the device remotely from your iPhone. Brilliant! I found the Curbi website and app invaluable. It is simple to use, easy to modify to fit my families needs, and it is reasonably priced at only $6.99/ month. 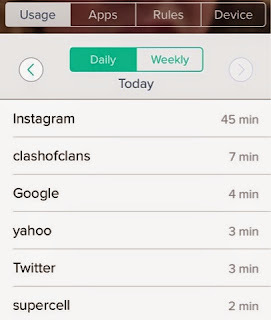 It gives me peace of mind, and the ability to monitor and protect my family from unwanted content and too much "screen time". The Claremont Pool was one of our favorite hang outs this summer, especially on those sunny, hot days. 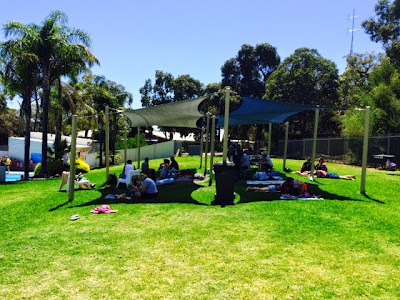 We loved that there was plenty of grassy areas covered by shade, a deep pool with diving boards, a splash pool and a playground. There was plenty of shade covering the pools and grassy areas. The toddler splash pool was lovely, and completely covered by shade. 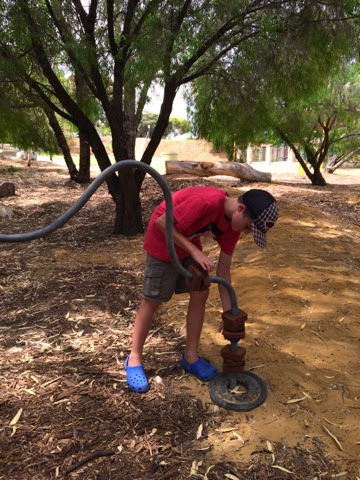 It was situated conveniently by the playground. The area set aside for "leisure" swimming was quite small. Most of the two large pools were reserved for lap swimming and swimming lessons. 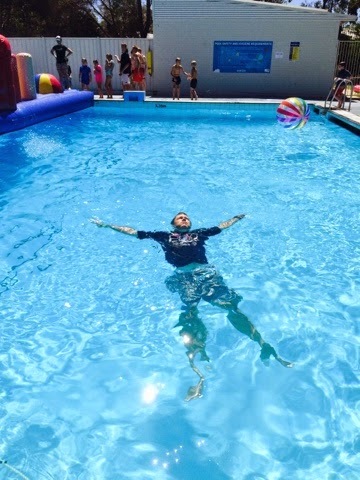 Luckily, the deep pool was available for leisure swimming. My three kids LOVED jumping off the sides and diving off the edge. They were disappointed that the diving boards were closed most days we visited. 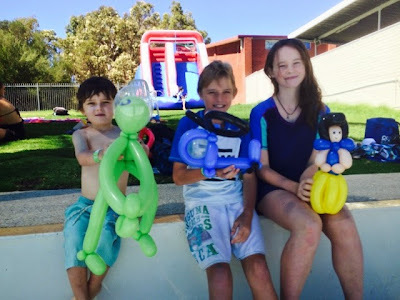 All three of my kids participated in VacSwim during the January school holidays. It was well run, organized, and all three of them passed their levels and gained better swimming skills. Vac Swim is available to all children ages 5 and up during school holidays. Swimming lessons cost just $1 a day plus pool entry fee. Claremont pool offers a special entry fee price for Vac Swim students and spectators. The kiosk at Claremont Pool had a good selection of coffee, hot foods, cold drinks and ice cream. There was also a nice selection of merchandise to choose from including Turkish towels and after swimming robes. 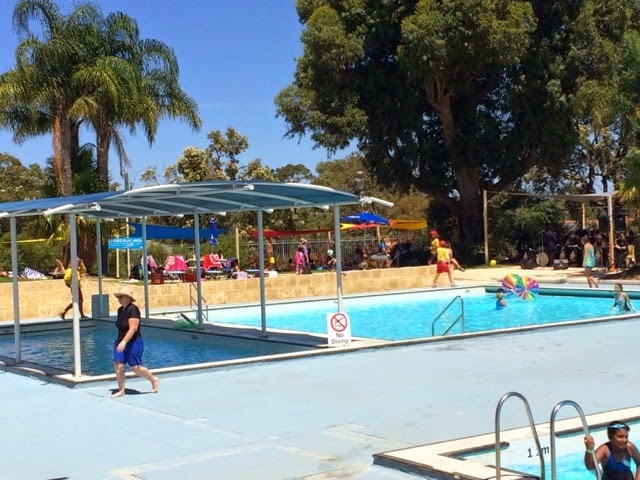 Entry fees for Claremont pool vary depending on age. There are punch cards available for frequent visitors at a discounted price. 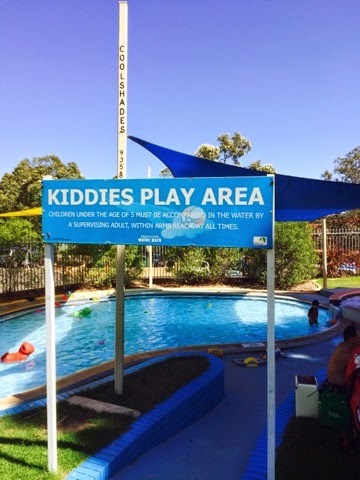 Children under 5 must be accompanied by an adult swimmer at all times. Children 8 and under must be supervised by an adult at all times. Children 10 and under must be accompanied by an adult at the pool. 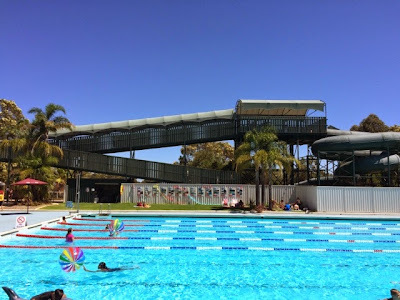 Claremont Pool offers learn to swim classes, lap swimming, squad swimming, water aerobics and more. 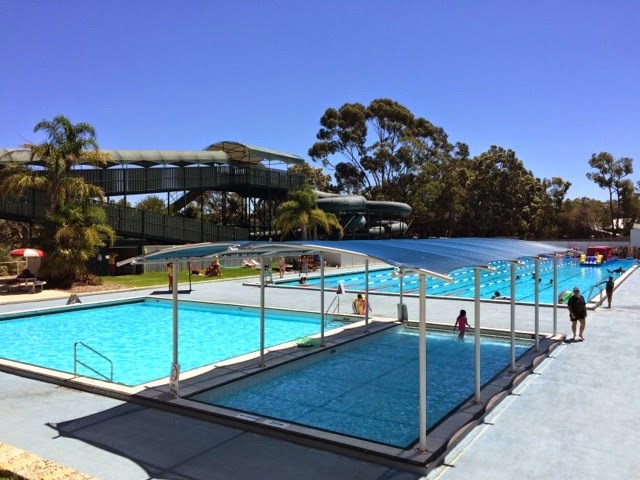 Facilities at Claremont pool include change rooms/toilets available with showers, free Wi-Fi, free to use BBQ and picnic areas, and club room facilities with air conditioning. Claremont pool had a pool hoist for those in wheel chairs or others that may need assistance getting in and out of the pool. The pools also had steps with handrails for easier access. 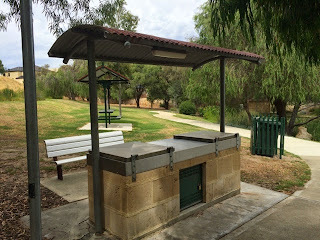 Claremont Pool is located at 12 Davies Road, Claremont. 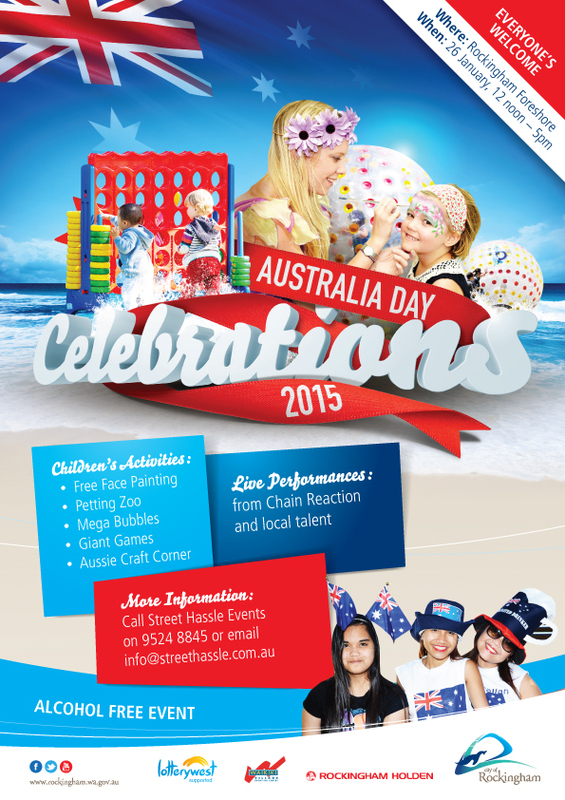 Australia Day is a day to gather with family and friends to celebrate this beautiful country. 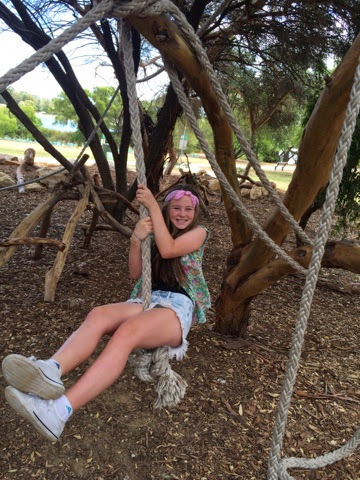 There are so many choices for Australia Day activities this year in Perth that it's going to be a tough decision for our family to decide. I'm thinking we will have to fit in several from my Top Thirteen List! 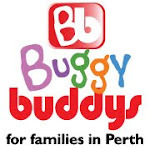 Giveaways, live music, and activities for the kids! 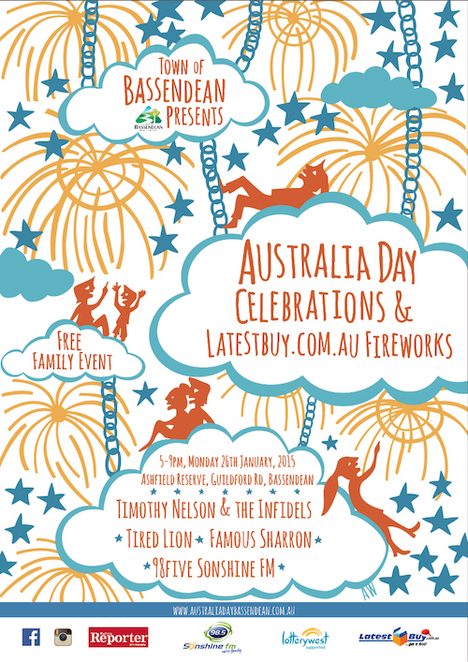 Then stay for The Indian Ocean Fireworks starting at 8pm! 100 FREE activites for all ages from 3pm! View the airshow from Langley Park from 3:30-7:45 pm before the fireworks! Catch the action of the river including float planes, water skiers, and boats from 5:00-7:30 pm. The traditional 21 Gun Salute fires at noon on Australia Day from the State War Memorial. Fraser Avenue precinct offers an excellent viewing opportunity during the Australia Day Skyworks. See map below for the BYO picnic zone. Entry is by gold coin donation. 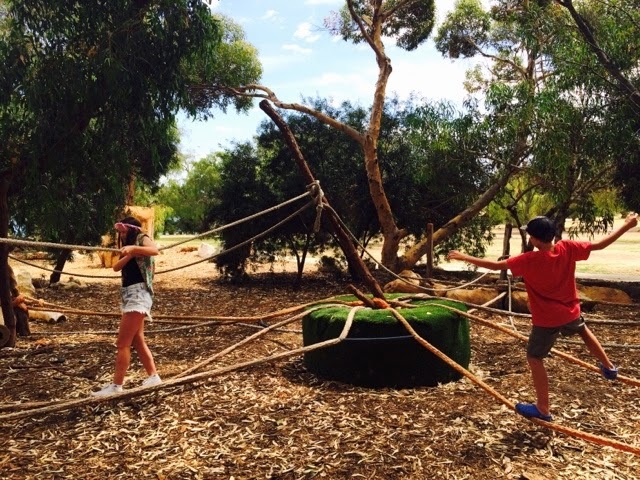 Start the day's celebrations early with Brekkie and fun activities for the whole family! 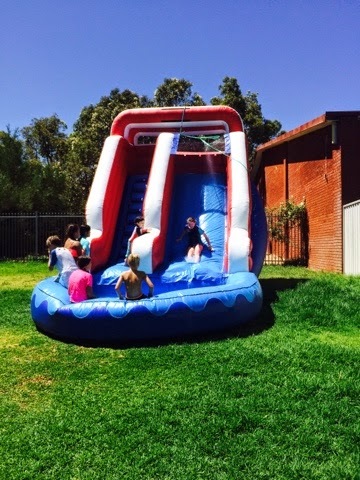 Roller Ball * Gladiator * Bouncy Joust * Bucking Bull * Aussie Animal Farm * Sandcastles * FREE Sausage Sizzle (with healthy option) and FREE ice-cream and so much more!!! 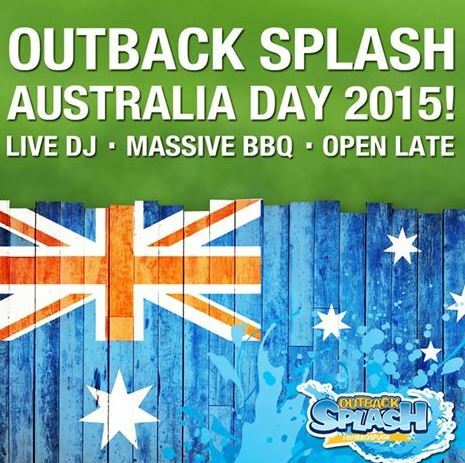 Family entertainment from 5pm including: carnival rides, live music, delicious food, and Fireworks at 8:30 pm. 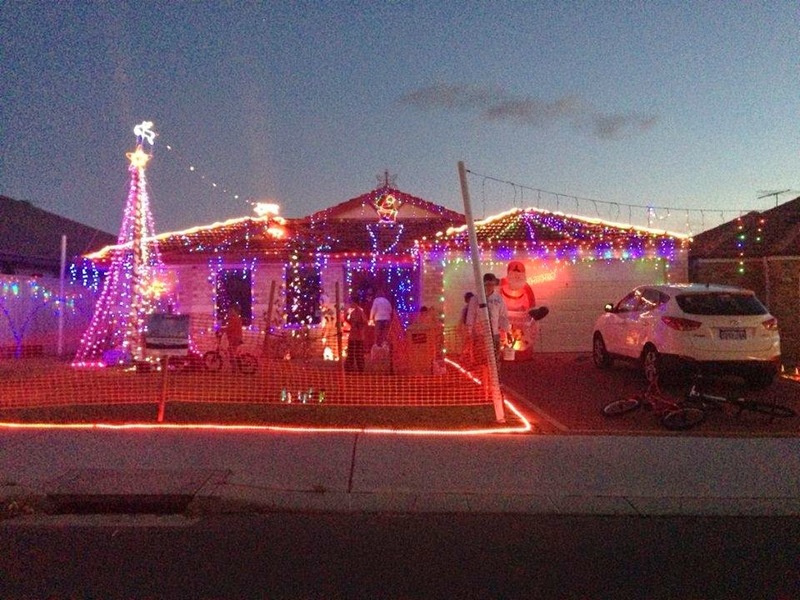 Best Christmas Lights in Perth Listed here! Younique Launch in Australia, United Kingdom, and New Zealand! 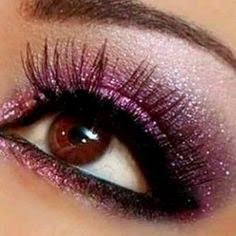 Check out these Amazing Younique Fiber Lashes! Grand Mirage Resort: The Kids rated it 5 Stars! 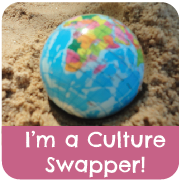 Culture Swap: Sharing Australia with the World!